Read our pre-match preview ahead of Tuesday’s clash with Motherwell. Aberdeen return home this Wednesday when they face Motherwell at Pittodrie. 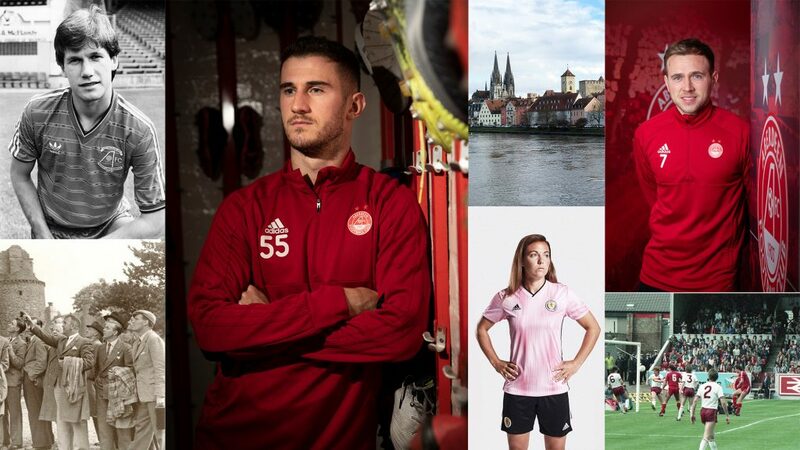 After the weekend’s defeat to Hearts at Tynecastle The Dons have the chance to immediately bounce back four days later and put their European ambitions back on track following a difficult spell. The hosts are looking for a first league win at Pittodrie since the 22nd of December and after slipping to fourth in the table, will require a win to potentially jump back into third with the league entering its final seven weeks. On Tuesday lunchtime Derek McInnes and Lewis Ferguson reflected on the Hearts game and looked ahead to the match with Motherwell. “We’ll dust ourselves down and look forward to the home game tomorrow and the focus turns to the home record of late. The only way we can stop that finger getting pointed at us is just by winning the game. We’re up against a team who are in good form over the last wee while. They’ve changed their way of playing and Steve’s done a good job. “We’re disappointed we’ve not shown the consistency in recent weeks that we would expect from ourselves and it’s up to us now to win firstly tomorrow night and take that confidence into the remaining games. “It’s very tight and everyone will be looking at the same opportunity – it is very tight between Hibs, Hearts, Kilmarnock and ourselves to try and cement that third spot first and foremost. We’ve got to just make sure we concentrate on ourselves and I do feel the consistency from our own individual performances is key. “The dressing room’s always positive and always confident. “The gaffer had a wee chat with us this morning just looking at the final push towards the end of the season. After an excellent last 20 minutes which saw them run out 3-0 winners over St Johnstone, Motherwell still remain with an outside chance of making the top six, but with two games remaining will require two wins as well as Hibs dropping points. Steven Robinson’s men have had a strong 2019 thus far, winning seven of their last ten matches and go into the game knowing that the last time they met Aberdeen they won 3-0 back in November. 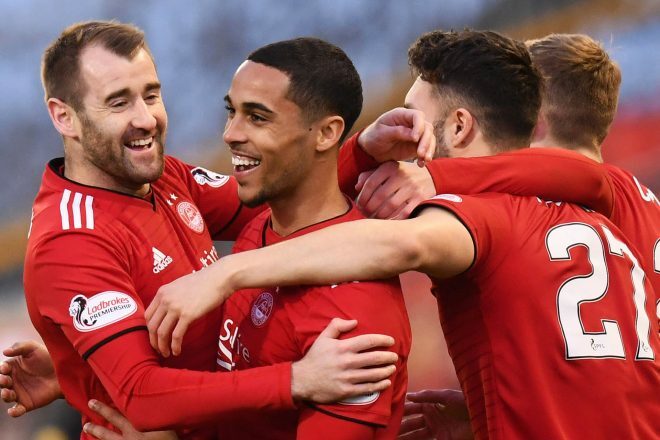 New Aberdeen striker James Wilson got his Pittodrie career off to the perfect start when the teams last met at Pittodrie. His first goal for the club six minutes into his home debut was the difference as The Dons won 1-0 to claim their second league win of the season. In the week before The Dons faced Celtic at Hampden for the Betfred Cup Final they were given a tough afternoon at Fir Park. In truth the visitors never really got going and Danny Johnston scored twice in five first half minutes to have the Steelmen ahead at the break. Despite pressing hard The Dons were undone again and Turnball made it three before the hour mark, which proved to be the final goal in a poor afternoon for the men in red. Wednesday will see Motherwell travel to Pittodrie for the 133rd time on league duty as they look for a 23rd win. The Dons have a resoundingly better record with 66 wins and the points have been shared on 45 occasions. Aberdeen’s biggest ever win in the fixture came back in 1979 when they ran riot in an 8-0 victory. 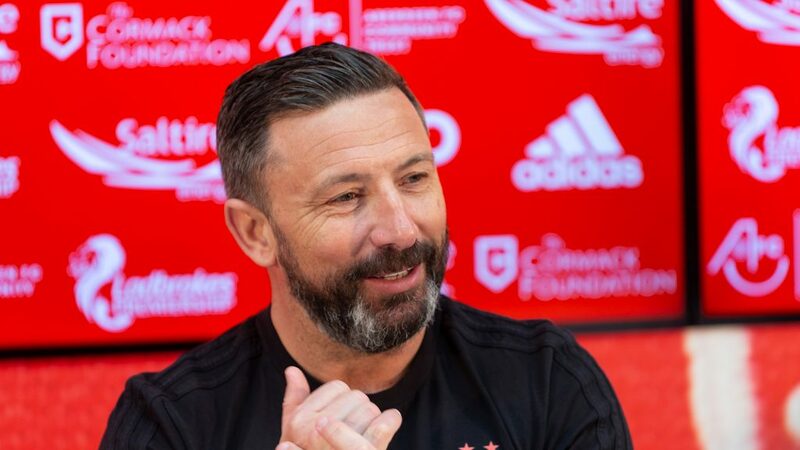 Under Derek McInnes The Dons have won six of the ten league ties with Motherwell claiming the points three times alongside a 1-1 draw back in October 2015. If you can’t make the game RedTV subscribers can tune into our matchday coverage from 7.30pm. Dons legend Joe Harper will be joining Dave and Andrew on commentary and international supporters can watch live. Post-match we will have reaction, goals, highlights and a full match replay. The Dons bounced backed to winning ways with a 3-1 victory over Motherwell under the lights at Pittodrie. Jake Hastie cancelled out Max Lowe’s early goal before some clinical finishing from Niall McGinn in the second half ensured that there would only be one winner. 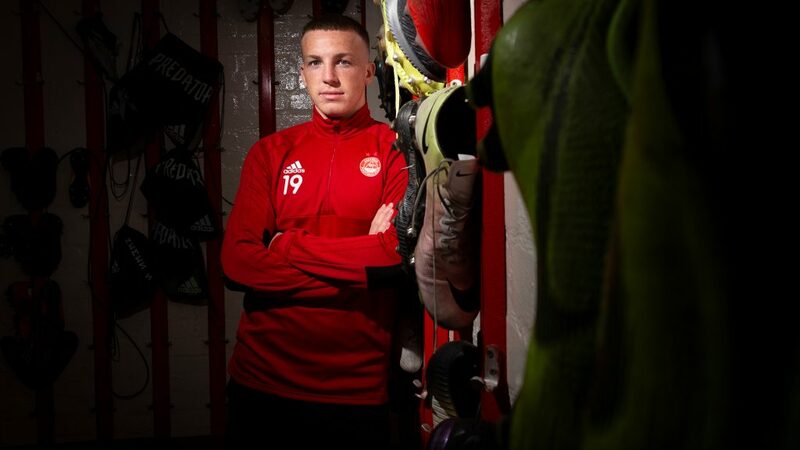 Derek McInnes made one change to the side that came off second best against Hearts at the weekend with youngster Dean Campbell earning his first league start for Aberdeen ahead of Greg Stewart who dropped to the bench. There was plenty to play for at Pittodrie with The Dons hoping to bounce-back from their weekend defeat at Tynecastle. Motherwell came into the game knowing that they needed to win in order to keep their faint hopes of a top-six finish alive. Since the turn of the year Aberdeen’s home form has suffered, failing to win in their last six home outings. However, the home side brushed away any doubts of faltering form with an early goal through Max Lowe. The full-back found himself in a decent area down the left hand-side. Sam Cosgrove was calling for it in the area and Lowe put in a cross to try and find him, his delivery was mis-hit and evaded both strikers, defenders and the Motherwell keeper Gillespie before dropping in off the back post and into the net. A slice of fortune for The Dons but an important goal nevertheless. The goal settled the home side who looked comfortable in the opening 20 minutes. Cosgrove had a couple of decent chances in the air which went just wide with Lowe and Shinnie also impressing in the early stages. After a relatively quiet start to the game the visitors were level with their first chance of the game on 36 minutes. A sharp pass from Tait cut open the Aberdeen back line and was taken well by Steelmen striker Jake Hastie. Hastie had the composure to smartly take it round the onrushing Joe Lewis and slot home at a tight angle. The goal was largely against the run of play but was well taken. The equaliser sprung The Dons back into life and Shinnie, Ferguson and McGinn all had efforts from range saved. Shinnie’s strike from distance was the closest, dipping narrowly over the bar. The game began to open up in the latter stages of the first half with both sides going for it. 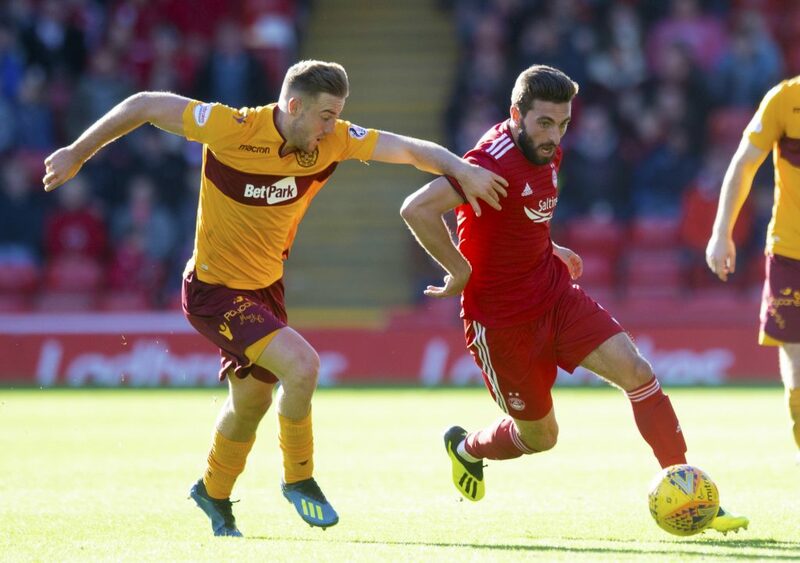 Aberdeen had another half chance on the stroke of half-time after Connor McLennan was presented the ball by a Motherwell shirt in the opposition penalty area. Almost taken by surprise, the midfielder’s effort lacked both the power and accuracy to challenge Gillespie in goals who saved comfortably. No changes were made by either side at half-time as the teams came out for the second half. Both teams were trading blows in the early stages of the second half with neither side able to conjure up any clear goalscoring opportunities with both defences clearly on top. Dom Ball became the first Dons player to go into the referee book after a foul on halfway breaking up a Motherwell counter attack. There was a lack of urgency from both sides and after the hour mark both McInnes opted for change with Dean Campbell making way for Greg Stewart. Both Cosgrove and Gillespie received lengthy spells of treatment after bravely attacking a dangerous McGinn cross. The Motherwell keeper got there first and managed to palm it away but collided with Cosgrove and took a hefty blow. Unfortunately for the visitors, Gillespie was unable to continue and he was replaced by Rohan Ferguson to play out the remaining 25 minutes in goals. His first action was picking the ball out of his own net after The Dons went ahead through Niall McGinn, Greg Stewart did well to force the issue cutting inside and trying a speculative long-range effort. His shot took a wicked deflection off a Motherwell shirt and landed straight into the path of McGinn who was following it up. The Northern Irishman made no mistake with the finish, lifting it into the roof of the net to give The Dons the lead. Mikey Devlin came on to tighten things up at the back in place of McLennan who had had a relatively quiet game by his standards. The Steelmen huffed and puffed but did very little to trouble the Aberdeen defence or Joe Lewis in goal. Seven minutes were added on at the end of normal time. There was a heart in mouth moment in added time when Grimshaw lost his marker and snuck in behind the Aberdeen backline. The Dons waited for a flag that never came but were fortunate enough to see Grimshaw’s looping header sail just wide. McGinn added the icing on the cake with a brilliant curling effort with the last kick of the game to put the tie beyond all doubt. Credit to the winger who could’ve gone to the corner to run down the clock but instead played a smart one-two with Max Lowe, cutting inside before curling his shot into the top right corner – finishing the game off in style.